Baltasar Jerónimo Gracián y Morales (1601-1658), Spanish humorist, satirist, baroque stylist, and philosophical novelist, is classed with the greatest prose masters of Spain's Golden Age. Born into a religious family in Calatayud, Aragon, son of a doctor, Baltasar Gracián was sent at 12 to study in the medieval atmosphere of Toledo. At 18 he entered the Society of Jesus and was sent to Saragossa and later to Valencia to study theology. Soon after his ordination as a Jesuit in 1635, he met Juan de Lastanosa, who provided Gracián and several of his creative contemporaries a home and financial support affording unlimited leisure for peripatetic conversation and meditation, as well as a means to publication. After holding several pastorates, Gracián served as field chaplain to the Spanish army under Gen. Pablo Parada. 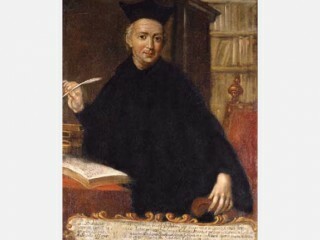 Later, while professor of religion at Saragossa, he published without the permission of his order a philosophical novel, El criticin, for whose cynical and pessimistic tone he received a reprimand from Goswin Nickel, the superior of the Jesuits. When Gracián published two other books under pseudonyms, Nickel ordered an official investigation of his defiance of Jesuit authority. As a result, Gracián was watched, his quarters were searched regularly, and no ink, pen, or paper was permitted him. Under this humiliation, Gracián petitioned for permission to resign from the order, a petition not only denied but punished by denying him his pulpit. Silenced, disgraced, and embittered, Gracián withdrew in poor health to Tarazona, where he died on Dec. 6, 1658. Gracián wrote five works important in the history of Spanish thought, of which El heroe (1637; The Hero), El discreto (1646; The Discreet Person), and El criticin (1651-1657; The Critic) stand out. In The Hero Gracián characterized qualities essential to leadership: wit, charm, discretion, and especial vigilance against fools. A leader, he says, must close his ears to the common people or lose them, for they respect not the leader whose ways they believe they fathom. "Let no one say Vox populi, vox dei; rather it is the voice of ignorance." "Use a little mystery in everything," counsels Gracián. Elsewhere he says, "Every success is due three-quarters to luck, one-fifth to sweat, only one-twentieth to ability." Gracián's hero is a unique person who succeeds by integrity, discretion, linguistic gifts, and above all by shrewd political achievements. He is the product of a mind steeped in the classic Italian publications on political philosophy. In The Discreet Person Gracián presents his friend and patron, Lastanosa, as a model leader of men. Gracián's most ambitious book, The Critic, is a kind of Spanish Pilgrim's Progress in that both are allegorical stories with a moral purpose. The work's lengthy and complex plot provides a broad and pessimistic allegorical vision of human life. The story revolves around two characters, Andrenio and Critilo, symbols of nature and civilization. They meet when the learned Critilo is shipwrecked on Saint Elena, where he finds Andrenio, a man untouched by civilization, living in a cave, ignorant of his parentage and of any language. Critilo adopts Andrenio and teaches him to talk. After they are rescued from the island and taken to Spain, they remain friends and share many adventures. When Andrenio is victimized by the deceitful Falsirena in Madrid, Critilo looses a diatribe against all mankind, concluding that "Men are bad, women worse." As Gracián mixes reality with allegory, the two travel in Spain, France, Germany, and Italy. In the principal square of an imaginary city, they find not men but lions, tigers, dragons, wolves, bulls, and panthers. In this land the rich are regaled with presents while the poor are neglected and the wise held in contempt. The two pilgrims see a judge sentence a mosquito to be hanged and quartered, while exonerating a criminal elephant. They go from the spring of youth, through the middle age of maturity, into old age, traveling via fanciful courts and palaces, plazas of illusion, squares of hypocrisy, and mansions of integrity, until finally they glimpse the wheel of time and death and the island of immortality, where they hope to find rest from their journeying. Rather than a novel in the 20th-century sense, The Critic is a vehicle employed by one of the most brilliant minds of 17th-century Spain to interpret the universe as he observed it. This canny and pessimistic Jesuit interpreted life in the light of one of his maxims, "Things pass for what they seem, not for what they are." Gracián's reputation as a baroque writer arises mainly from his Agudeza y arte de ingenio (Mental Alertness and Ingenuity as an Art), in which he characteristically followed such baroque form patterns as use of neologisms, antitheses, parallelisms, inversions, epithets, obscure metaphors, and ellipses. In order to collect and anthologize his innermost thoughts, Gracián thoroughly combed his own works published before 1647 to compile Oráculo manual y arte de prudencia (The Art of Worldly Wisdom). This book is one of the great modern collections of maxims. The lengthiest recent study in English of Gracián is L. B. Walton's introduction to his translation of Gracian's The Oracle: A Manual of the Art of Discretion (1953). An older study in English is the introduction of Joseph Jacobs in his translation of the same work, entitled The Art of Worldly Wisdom (1892; repr. 1943). Recommended for detailed analyses in English of Gracián's works is Aubrey F. G. Bell, Baltasar Gracián (1921). A more recent work is Monroe Z. Hafter, Gracián and Perfection: Spanish Moralists of the Seventeenth Century (1966). General historical background is in John Crow, Spain: The Root and the Flower (1963). View the full website biography of Jeronimo Gracian Y Morales.